In this circuit a current sensing resistor is connected in series with the series transistor. The voltage drop across the current sensing resistor, R4 will be the base emitter voltage of the transistor T3. The value of this resistance R4 is chosen to be small. For example we connect a 1 W resistor and if the load current is less than 500 mA; the voltage across the resistor will be less than 0.6 V. Therefore T3 will not function. The circuit works normally. If the load current increase beyond 600 mA the voltage drop across the resistance R4 , will be sufficient to turn on the transistor T3. By properly choosing the value of resistance R4, the level of current limiting can be adjusted. 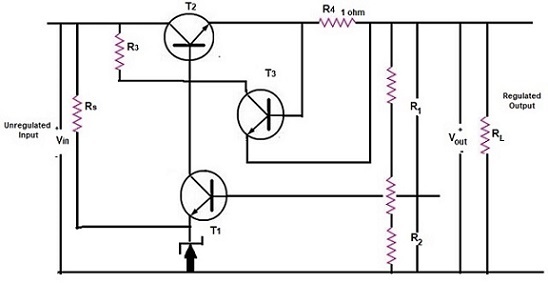 The disadvantage of this circuit is that large power dissipation takes place at the series transistor, when there is a short circuit at the output terminals.